Writers often hoard ideas, right? We huddle with our screens, our pens, our ink and paper, and use our mind as a net to gather ideas and make sense of them. I do that. But I am also intrigued by the collaborative nature of online spaces and how we might open up our own ideas to others and let our stories and poems go, and see where they end up. 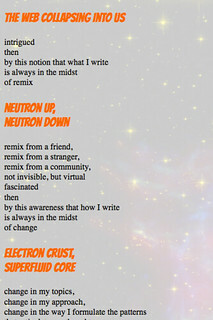 This week, I used a tip from the Teach the Web MOOC to use Edit Pad, and I started a poem, which I then tossed into the world with an invitation for others to add, remix, delete, and do what they would with my words. You never know who might be up for such a challenge, but luckily for me, I had Ian, Chad, Hayfa and Laura willing to jump into the mix. And wow …. it was pretty cool. Not only did they add words, they added a music soundtrack, a background image, different kinds of fonts … as well as their own lines of poetry. You might think it would be cool to watch that collaborative process unfold, right? Well, with Edit Pad, you can. 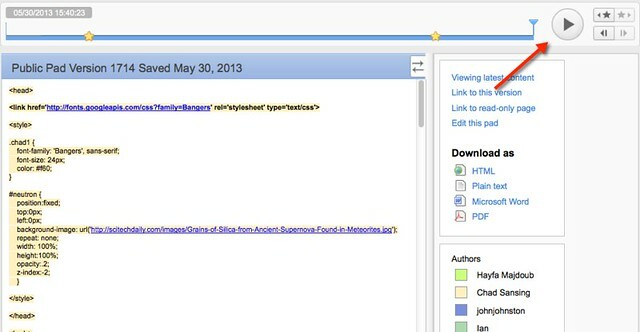 This open source html editor/notebook comes with a “time slider” so that you can watch the document grow from start to finish. I found it mesmerizing, particularly as my words truly did become fence posts for the others to build around. Or maybe we need another analogy. Maybe my words were stars, and Chad, Ian, Hayfa and Laura built a galaxy around me. I like that much better. Thank you to Laura and Chad and Hayfa and Ian for being writers with me. 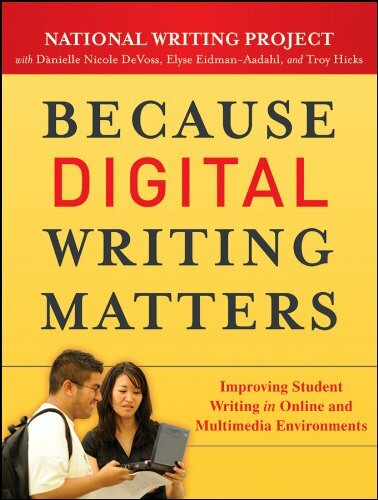 Yesterday, a visitor asked a bit about how I teach the Memory Objects/Narrative Writing/Digital Story assignment, and I am happy to walk through what we do. First, this writing is part of our unit around paragraph structure and paragraph writing. The emphasis for this particularly piece of writing is “narrative” and telling a story. 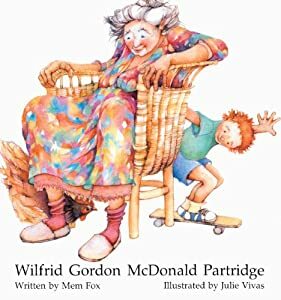 I begin by reading the picture book Wilfred Gordon McDonald Partridge by Mem Fox as a way to talk about memories. This delightful picture book tells the story of a young boy who helps his elderly friend recover her memories through a series of gifts. It’s a perfect segue into our discussions around not just memories, but the artifacts and objects that we collect to remind us of events and people and experiences. Second, they begin their writing. Since this is a lesson around paragraph structure, we emphasize through graphic organizers some of the main ideas, and how to develop the body. This paragraph later becomes the script for their digital stories. I share my own examples with them, and show them a few digital stories from prior years. For some, the hardest part is figuring out what to write about. So, I give them a few days to mull it over. Third, we jump into iMovie. Since most have not used iMovie before, I give a tutorial and then they had a good part of two days to play around with the program in ways not related to the digital story. I showed them how to add titles, use transitions, embed music, drag in photos, etc. This is not wasted time. This play time gives them a chance to explore, try out techniques, fail and try again, and more. I have found they need a good grasp on the possibilities before the real project begins. When they are done, they have the option to upload to our class YouTube site, or just export to the desktop. The whole project takes about a week (of about 30 minutes a day), although I continue to have some stragglers. That’s always the case. This is one of the projects that I do not grade. Surprisingly, of my 80 students, only two have asked me that question (will this be graded?). Instead, I see this as a way to value writing, introduce a useful bit of technology, and offer up an authentic publishing venue for them to tell a story. The level of engagement is very high across the board. It reminds me that if the activity is enriching as an experience, the need to grade every little thing seems a little less important. At least, it does for this particular kind of writing/technology adventure. 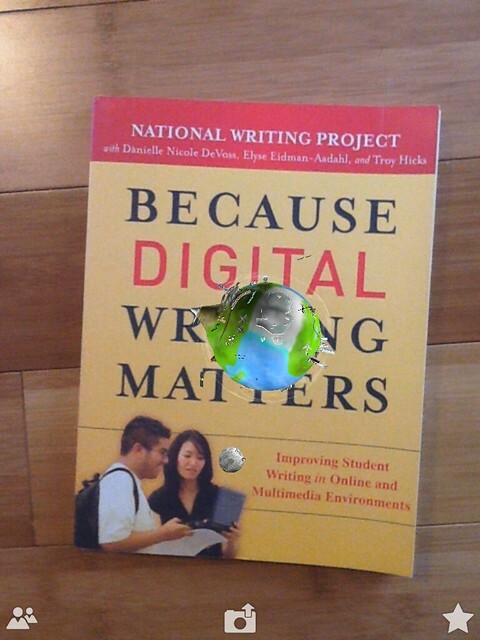 I hope that helps you think about how to bring digital storytelling into your classroom. My sixth graders are knee-deep in iMovie this week, as they use a piece of narrative paragraph writing as a script for a digital story. Their assignment is to find a tangible physical object that sparks strong memories for them, and then write about the object and the memories. Then, we move over into iMovie to create a digital story about the narrative memory. For most students, this is their first experience with iMovie (but not with digital storytelling, as we worked with Photostory 3 earlier this year on the PC). I scheduled in a few “play days” last week, to give them time to explore such things as titles, transitions, adding music, and more. This week, they are getting to work. There are a lot of things that I like about this Memory Object Digital Story Project, including the tapping into memories, the use of an object to represent an abstract idea, technology for a meaningful purpose, a short doable project (stories are about a minute long), and engagement with media in a variety of ways (some are moving into Garageband to create their own music soundtracks). Here is one of the first digital stories to get done this week. It’s a great showcase piece, as she crafts a gem of a digital story. And, here is the piece that I had done to show them what a Memory Object story looks like, and also, to share with them a piece of my own childhood. They really loved it, and got a kick out of seeing the “younger me” in some of the photos. You can also access the comic here. This is very exciting. The National Writing Project, in partnership with a number of other organizations, has officially launched its Educator Innovator website and activities. I am involved in one piece of the larger puzzle — I am a facilitator with the upcoming Making Learning Connected MOOC — but there are a lot of neat things unfold through the Educator Innovator network, including grant opportunities, partnerships, and more. I’m in with that. You? I was wondering how my 8 year old son, the youngest of three boys, would react to Frank Asch’s Star Jumper as a read-aloud. I knew he would like the sense of adventure (he did) but the story revolves around an older brother so desperate to leave home because of his incredibly annoying little brother that he builds a space ship (The Star Jumper) in an attempt to put the universe between himself and his little sibling. My son didn’t even flinch, and the older brothers didn’t say a thing (they often hover on the outskirts of read-aloud). Hmmm. Maybe he is not that annoying, I was thinking, only to break up a squabble later on in the day. OK, then. Maybe they (older boys) are not the cardboard genius types, as is Alex, the main character, in Star Jumper (Journal of a Cardboard Genius). Asch spins a quick tale here, as Alex designs his spaceship and other assorted equipment needed for his adventure (The Atom Slider, the Microblaster, the Duplicator) out of cardboard, assorted plastic parts and … duct tape. This is the first in a series of books about Alex, and my son and I read this first one in a single day. I sort of wish I had grabbed a few more at the library, but I guess that just gives us another excuse (as if we need one) to head to the library again this week. We both liked the sense of imagination at work, even if Alex comes across as too self-centered and the little brother, Jonathan, is … well … pretty annoying. In the end, Alex does not launch into space, as he has planned, because another turn of events unfolds (a girl) but I suppose that’s why Asch has written a series here. Star Jumper has a brisk plot, which was perfect for a one-day read-aloud. We’re trying to keep things light and fun as we share out teasers for our summer Making Learning Connected MOOC adventure. As such, I built a video game in Gamestar Mechanic and I invite you to play, and learn more about the summer activities and Connected Learning. We’ll be sharing out information soon about how to sign up and participate. For now, we are hoping to spark your interest. Play the game by clicking on the Game Map above or on this link … right here. Or, play the game as embedded in this post (if your device allows you). If you have ever done a video project with students, you may notice how much they love bloopers. I’ve had kids who have finished a project and then asked, Can we make bloopers? As if bloopers were something planned instead of unexpected. They would actually stage the bloopers. And yet, bloopers add a real sense of fun to making movies, right? I always let them go ahead. Anyway, I was working on a welcome video for our Making Learning Connected MOOC project (sign up now — the adventure begins on June 15), and we had this idea of paper airplanes coming into the frame. I’m not sure it is going to work. While I was filming, I had my youngest son shooting airplanes at me. Needless to say, it took us a few rounds. I didn’t get a good video, but I did get some bloopers … so why waste the footage?